Double Glazing condensation problems, answered here with a comprehensive explanation and helpful advice. By David our expert Window Wizard, providing a local upvc repair service in and around the Bexley area. Misted windows and double glazed condensation, is a common problem. We have received a lot of inquiries from customers regarding, condensation problems. There are 2 very different types and causes, of window condensation problems. However they are not to be confused, as solutions are completely different. 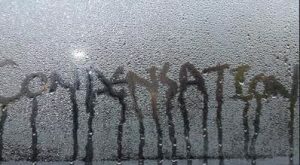 I hope that our explanation, will help you identify which type of condensation problem you have and how to fix it. Condensation consists of small drops of water which form when warm water vapour or steam touches a cold surface such as the glass in windows. This is a result of hot air or steam becoming cool. Condensation in between the double glazed, glass sealed unit. This type of condensation you can see but not actually touch the water or condensation with your finger. Please see the picture as shown below, illustrating water and condensation between the glass. The primary reasons for condensation between the glass is due to old age, typically over 10 years old. Or if the unit has been badly fitted such as a screw head, packing wedge has pierced the edge of the unit. Furthermore double glazed units that are south facing so extra exposed to the sun, are less durable than double glazed units that are not in direct sunlight. Condensation within the glass can also occur, when the glue of the joining strip which holds the 2 pieces of glass together has broken down, this allows moisture to penetrate between the glass panes. 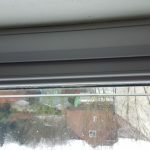 This type of double glazed condensation problem is a simple and easy fix. This can be solved by replacing the glass sealed unit. Condensation appearing on the inside of the windows / glass. This type of condensation you can touch and feel the water with your finger. Please see the picture as shown below, illustrating water and condensation on the glass. Most times condensation within the room is NOT caused by a window issue but a damp problem or lack of airflow. What causes Double Glazed Condensation on the inside of the windows? One reason for condensation on the inside of the glass, could be lack of airflow in the room. For example, if you shut your bedroom door and wake up in the morning with condensation running down your window glass, this is caused by lack of air flow. 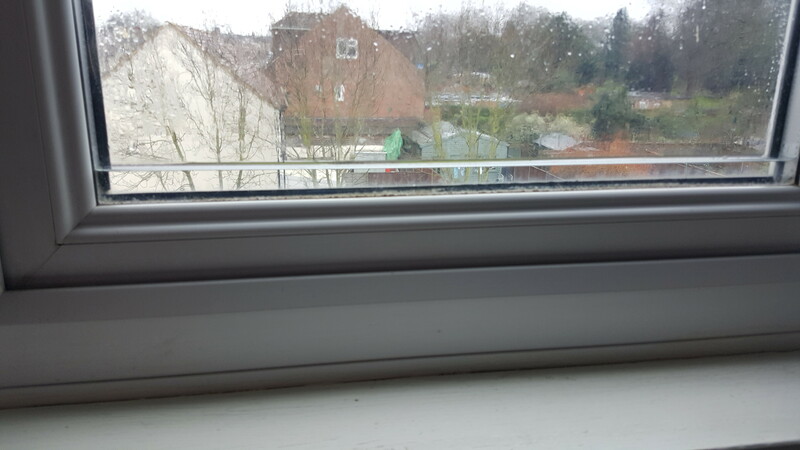 Some double glazed windows have a facility where you can lock the window open in the vent position, this could help solve the problem. Check your properties air bricks and vents. Ensure that they are not blocked and allow adequate air flow. Or if you have recently had your loft insulated but not had vents fitted to the soffits or roof tiles. Also if your loft installation was fitted tight into eves, this can cause a damp and condensation issue as well. Heavy curtains or blinds can reduce airflow and cause double glazing condensation issues, on the inside of your windows. Another possibility could be that your property has a damp problem, in which case you would need a to contact a local timber and damp specialist. Who have the correct instruments for testing and finding the source of the moisture. Do trickle vents fix condensation problems? You can test this by leaving your small window open one inch and see if it cures the problem. Another solution is to install a dehumidifier however, they can be expensive to run. Also very noisy and require the water tank to be emptied regularly. If you need to close your room door, why not fit a louvered vent in to the door so air can still flow between rooms. Check that there are no leaky water pipes, including radiators. Ultimately ensure you have a good airflow, by leaving your internal doors open such as your bedroom door at night. If you prefer to sleep with the bedroom door closed, then perhaps fit a vent in the lower panel of the door which will allow airflow even when the door is shut. Check that your air bricks are not damaged or have been obstructed inside and outside. In addition, if the glue joining the 2 pieces of glass together, is penetrated or deteriorated due to old age. This will allow moisture to get between the glass panes and cause a condensation problem.